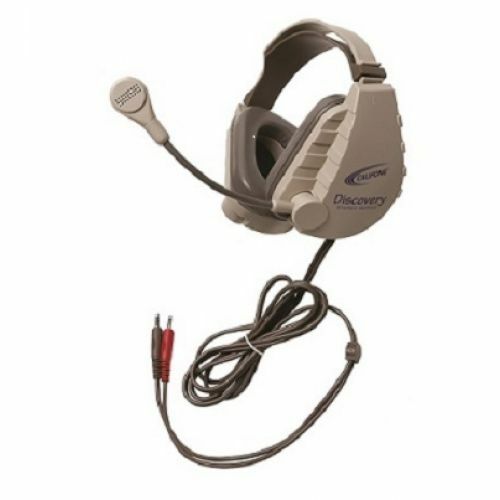 Catalog Home > Califone International, LLC > DS-9V Noise Cancelling Headphone w/ mic. DS-9V Noise Cancelling Headphone w/ mic. The noise-cancelling microphone on the Discovery is designed for voice recognition software and is why the Discovery headset is so widely used for both language activities and game-based learning. Changing the cord allows the same headset to be used longer than other models and in either monaural or stereo applications. 3.5mm stereo headphone plug, 3.5mm mono dynamic mic plug, replaceable 6' cord, flexible boom arm.